The number of dead pigs discovered in Chinese rivers around Shanghai has risen to almost 14,000, officials say. There is no word from the authorities about the cause of the deaths. Last week, officials retrieved nearly 6,000 pig carcasses from the Huangpu River network. They insisted that water from the river was safe. Residents have condemned the local government's failure to account for the carcasses, which some believe have been dumped by farmers upstream. Workers have been pulling dead pigs from rivers that supply Shanghai with drinking water for the past 11 days, sparking alarm on internet chat sites. Correspondents say that the carcasses are embarrassing for the city's authorities, who want Shanghai to be seen as an international financial centre. The scandal has also highlighted China's difficulties with food safety as pork is one of the country's most popular meats. 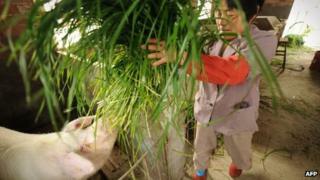 Farmers in the Jiaxing area of Zhejiang province, upstream from Shanghai, have denied dumping the pigs in rivers. Improperly disposed of animals that have died from disease can often end up in China's food supply, experts say, despite laws against such practices. So far, the general mood in the affected areas has been of concern rather than outrage or panic. The Chinese public has seen food scandals before, such as the use of oil scraped from drains for cooking, and baby formula contaminated with chemicals. Laboratory tests have identified that some of the pigs had porcine circovirus, a common disease that affects pigs but not humans. Jiaxing officials have said that the pigs may have fallen victim to the cold weather. The scandal comes amid growing concerns about China's environment, including recent record smog levels in Beijing, and water and air pollution affecting villages.